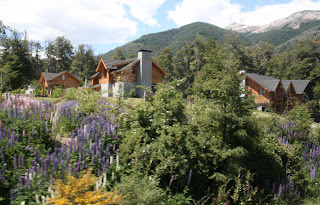 PHOTO CAPTIONS: 1-2: Scenes between Puerto Montt to the border, 3-4: Andre at the Chile-Argentine border, 5-6 Views coming into Bariloche, 7. Jean and me on Mara's balcony, 8. Another view from Mara's balcony. The "tree" is a cell phone tower, 9. 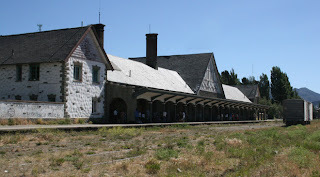 Bariloche train station where I sprinkled some of Maya's ashes, 10-13. 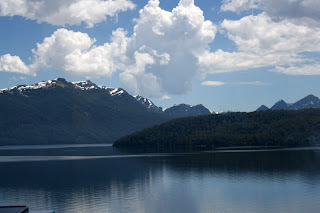 The views leaving Bariloche the next day. 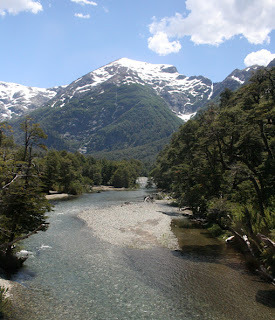 Dec. 26-27, 2007: I don’t know if anybody else ever called Bariloche “the Swiss Alps of Argentina,” but they should. 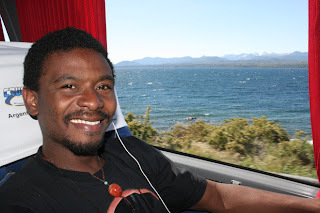 Andre and I didn’t mind the 6-hour bus ride (plus 2 hours at the border) from Puerto Montt, Chile because it was so spectacular -- probably some of the most breathtaking of our entire trip. I wouldn’t have been surprised to see Heidi and her grandpa get on the bus. 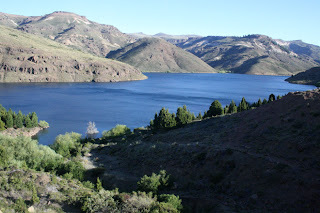 There were lakes and rivers everywhere, snow-capped mountains, lush green vegetation, clear blue sunny skies. Around every bend was another calendar shot just waiting for me to snap. I actually wish the bus could have gone slower, especially when we caught only a glimpse of Salto de los Novios: Lovers’ Falls. 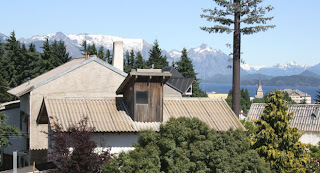 Bariloche slopes uphill from the lake and is covered with little German-style houses, complete with pointy roofs and gingerbread trim. 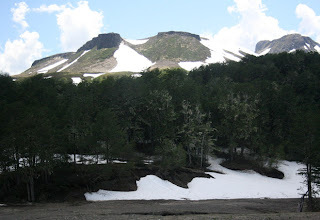 It’s a big ski resort in the winter months (June, July, August). 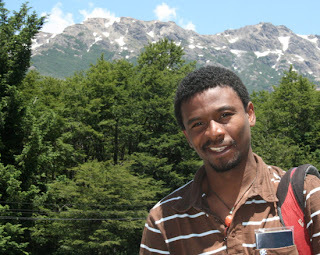 Jean, our friend from Santa Cruz, has been studying Spanish and doing volunteer work planting trees. She reserved the basement apartment for Andre and me at Mara’s house where she’s been staying. It was wonderful to have such a lovely host, spacious room, awesome view and delicious parrilla (grilled meats) all waiting for us. 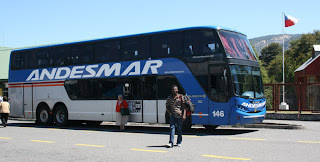 Jean was anxious for us to arrive because she’d been without a camera for two weeks, ever since her backpack – complete with iBook and camera -- was stolen at the Buenos Aires bus station when she turned her back on her stuff for a minute to check the bus schedule. Since most electronic equipment is twice the price down here, we offered to sell her Andre’s Canon Powershot. The next day, our friend Hubert met us in Buenos Aires, new camera in hand. I love when things work out like that. Dinner at Mara’s, as in most Buenos Aires households and restaurants, begins at 10 p.m. Who ever thought of that idea? You end up going to sleep well past midnight, with a big heavy meal sitting like a lump in your stomach. And since it was our only chance to get to know the charming Mara and her daughters, we probably stayed up even later. Turns out she raised four kids by herself by renting out rooms in her gorgeous house. She also likes to travel, so she has a friend who can take over when she leaves the country. She especially liked my stories about traveling with Oma when she was in her 80s. 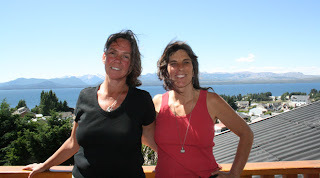 Well, Jean will have to tell you all about Bariloche because she spent a few weeks there, hiked 35 miles in one weekend, sampled their famous chocolates, and tasted many delicious meals in Mara’s kitchen. 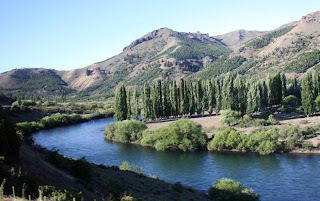 Andre and I barely had 24 hours there before we began a 19-hour bus ride to Buenos Aires. Another painless and scenic journey. 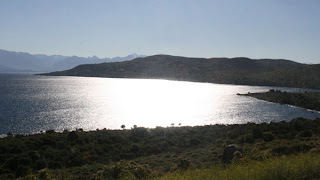 After all these marathon bus rides in South America, I doubt Andre will ever complain about the six-hour jaunt between Port-au-Prince and Santo Domingo again.